The gorgeous space wallpapers are from NASA’s Hubble site, they were resized to the desktop and you can grab the one shown on the MacBook Pro here, and the one shown on the iMac is this galaxy shot. Any workstation that is flush with natural lighting and looks towards a window is a big plus in my book, it’s usually the best soft lighting source and tends to keep glare to a minimum, plus it makes it easy to give your eyes a rest throughout the day. 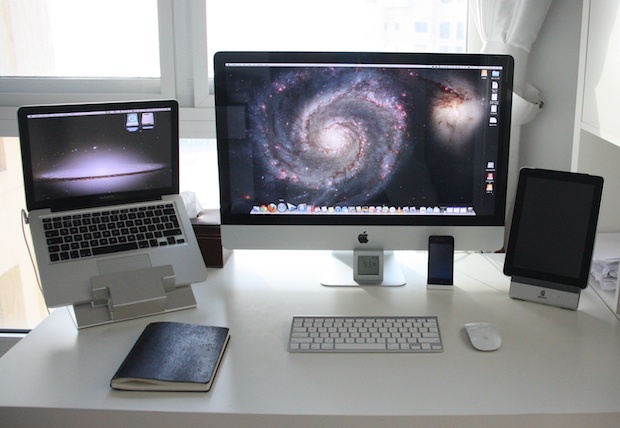 Try arranging your desk that way, you’ll probably agree. Gorgeous, I would be curious to know the company? Having an iMac I’d have personally gone with a MacBook Air for maximum portability instead of the Pro, but to each their own. Does the wireless keyboard serve both the iMac and the MacBook Pro? Just curious to understand how each piece of hardware is used in the setup. You can use Teleport or Synergy to do that, I use the same keyboard and mouse on all my Macs with that way. Both are free too! 4) Desk size: perhaps it is small – but it suits me just fine – I find the bigger the desk the more mess and crap I put on it – this keeps me disciplined and neat – you cant see in the photo but on the right is a 4×4 box shelf that keeps everything organised so that the desk is free – But maybe one day I’ll expand it. What are the stands for your MacBook and iPad? What is the dock you are using for the MacBook Pro? Would love to know! Thanks. Nice gear. But that desk is insanely small. It looks like a very cramped, uncomfortable place to work. Q: Why are the iOS devices jailbroken and why do we need to know that?